I wanted a low plant stand to put a few cacti or maybe a lamp on, but I wasn’t really into anything I was seeing in stores. Pinterest didn’t let me down though, and I was inspired by a similar DIY at Sugar & Cloth to make my own little plant stand this weekend. It has a mid century modern vibe that I like and it was really easy to make. It would have taken all of 10 minutes to complete if I wasn’t taking pictures at the same time. The finished dimensions of this mid century inspired plant stand are 12″ wide by about 14″ tall so it’s pretty small. If you want a larger table, Lowes carries larger wooden rounds and the mid century legs come in a range of heights. 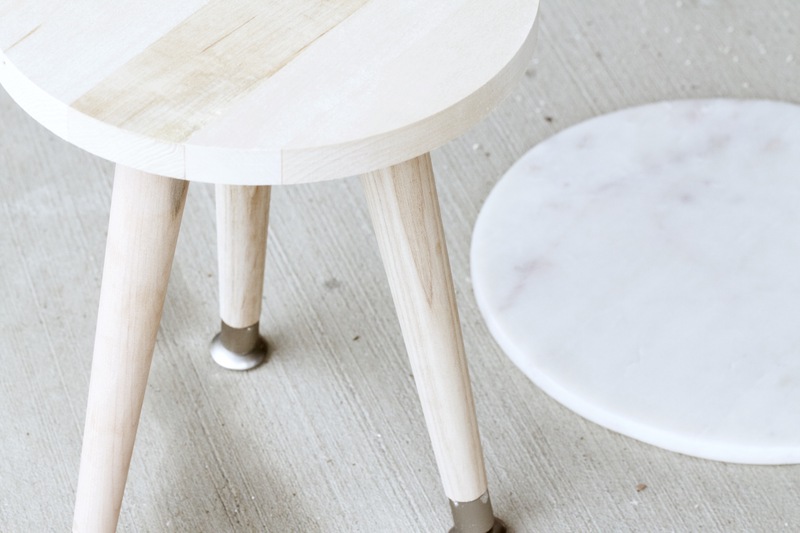 A larger marble top could be cost prohibitive, so you might consider just leaving the wood top or making a topper for this table from a less expensive material. Something like concrete could be cool. 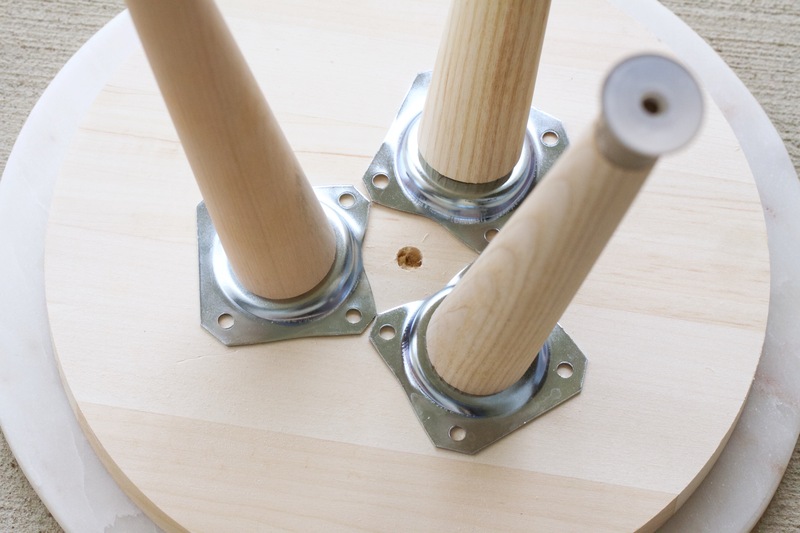 The clock face will act as a support for the marble top and give you something to screw into to attach the legs. 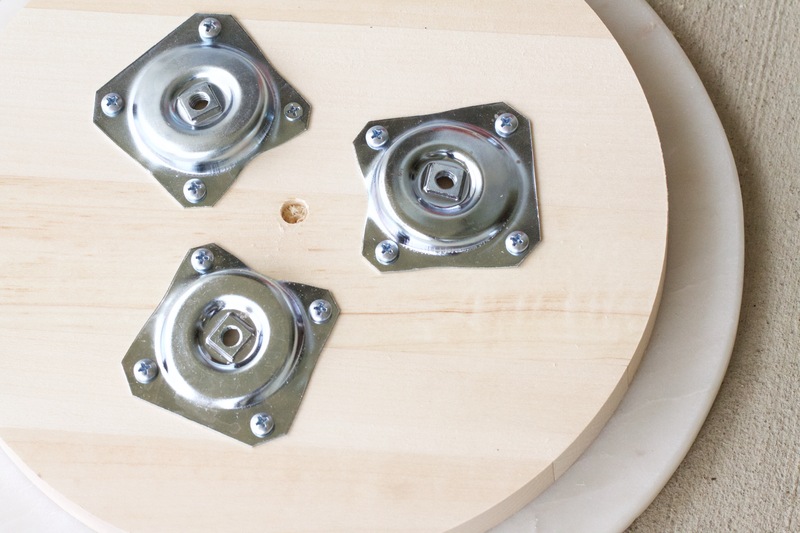 You just screw the angle plates to the clock face, twist the legs onto the angle plates, flip the table over and place the cheese board on top. I get that you might want a little more instruction than that, so here that is again in more detail. First, twist the table legs onto the angle plates and arrange them on the clock face to judge where they should be attached. I did this with the clock face sitting on top of the marble cheese board so I could get a better idea of the final placement. The clock face has a hole on one side but the hole doesn’t go all the way through to the other side. I used that hole as a landmark to help arrange the angle plates. I made sure to attach the legs to this side of the clock face so the other side (the side without a hole) will look nice even without the marble top on it. I moved the legs a little further from the center to make the plant stand a little more stable. Once you have the legs arranged the way you like, take a pencil or marker and make a dot inside all of the screw holes in the plates. You should have 4 dots per plate. 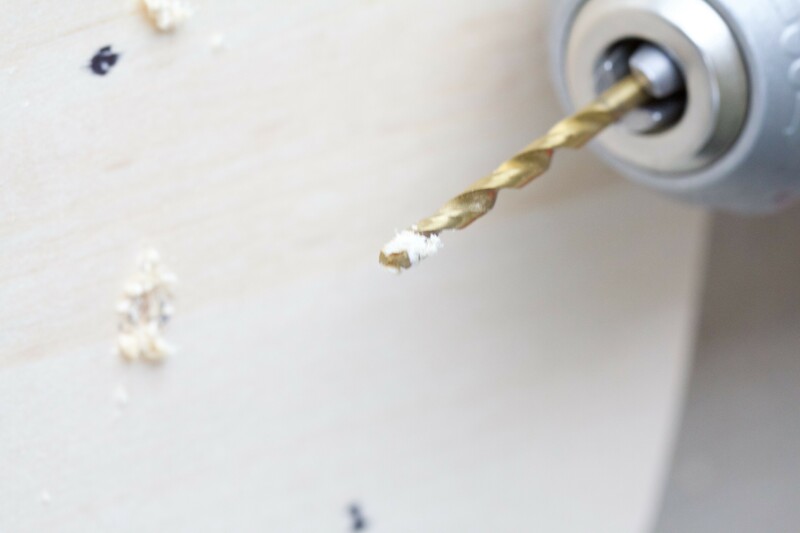 Take the legs and plates off of the clock face and drill pilot holes into all of your dots using your 5/32 drill bit. You don’t have to make them deep. Less than a centimeter is probably fine. Don’t drill all the way through to the other side. 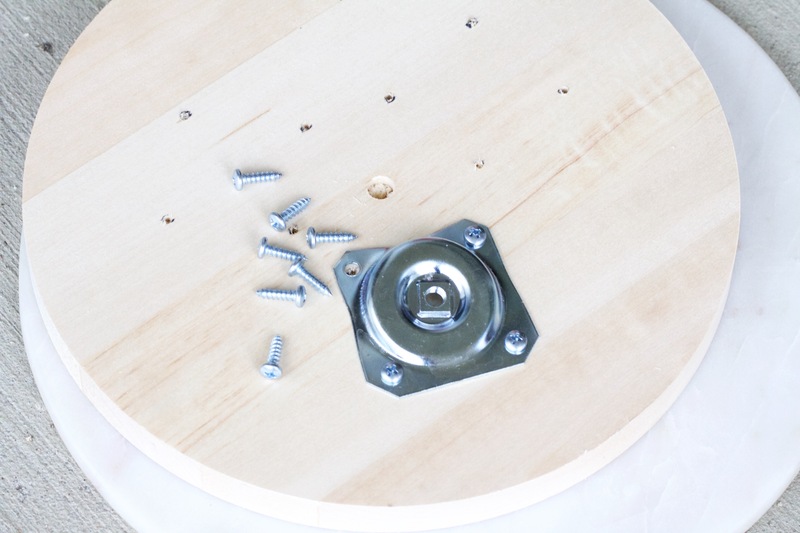 I’m not sure you need to drill pilot holes, but it makes screwing the plates in place a little easier – the pilot holes help guide the screws into the right position. Now, twist the legs off of the angle plates (this makes screwing the plates in place easier), and re-position the plates over your pilot holes. Use your Philips head drill bit to affix the plates to the clock face with the screws that come with the plates. When all of the plates are attached to the clock face, screw the legs back into the plates, flip the plant stand over, and set the marble cheese board on top. I didn’t use anything to stick the marble top to the table. It’s held in place by its own weight. I did that for a couple of reasons. I like options. I wanted to be able to switch out the marble top with a different material, a different color marble, or even use the plant stand with just the wood top. 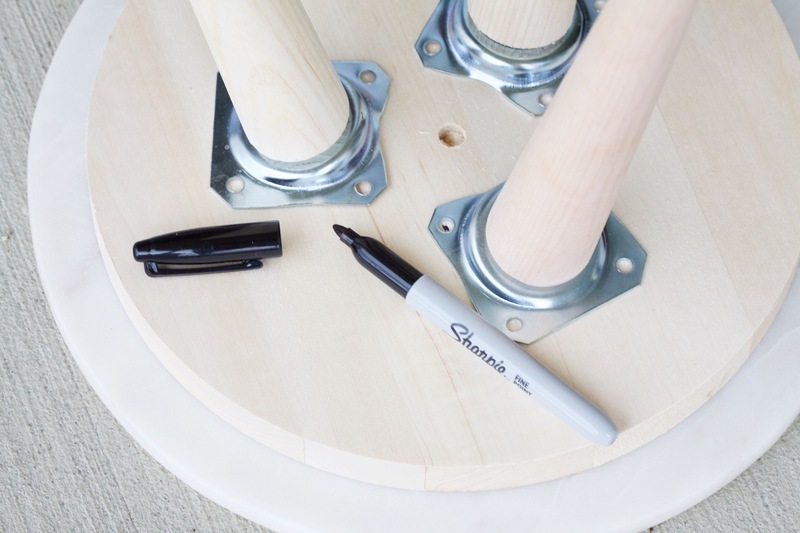 You probably noticed that this plant stand isn’t finished with anything – there’s no paint or polyurethane or stain on the wood. I like the look of the raw wood, but I wanted the option to paint or stain it later and that will be way easier if the marble top is removable. Even if I decide to leave the color, I’ll still want to apply some polyurethane or something to protect the plant stand. 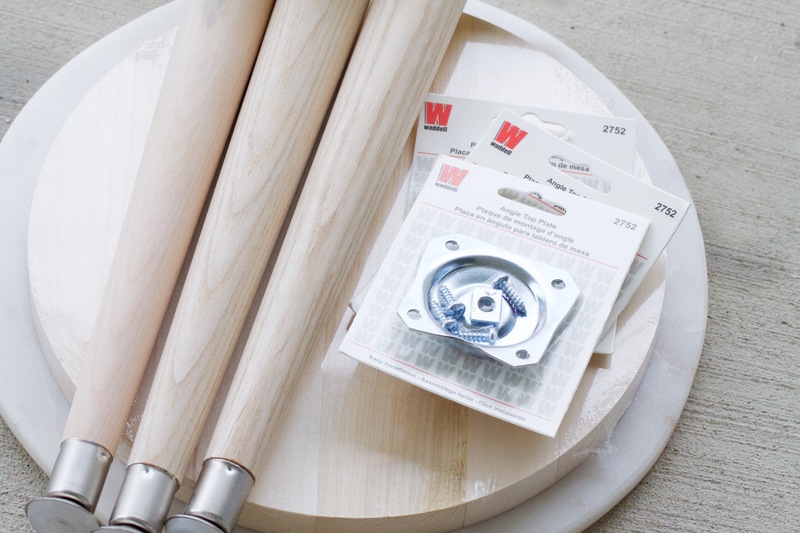 This DIY was so easy it almost feels like cheating to call it a DIY. And the basic idea – attach mid century legs to a piece of wood then top with something cool – seems almost infinitely customizable. Since I made this little plant stand I’ve dreamed up a ton of possible variations. So, yeah. I’ve got ideas for days. I’m already plotting my next table. I’m thinking of making a pair to use as coffee tables or side tables. I might even make another plant stand. Let me know what you think. 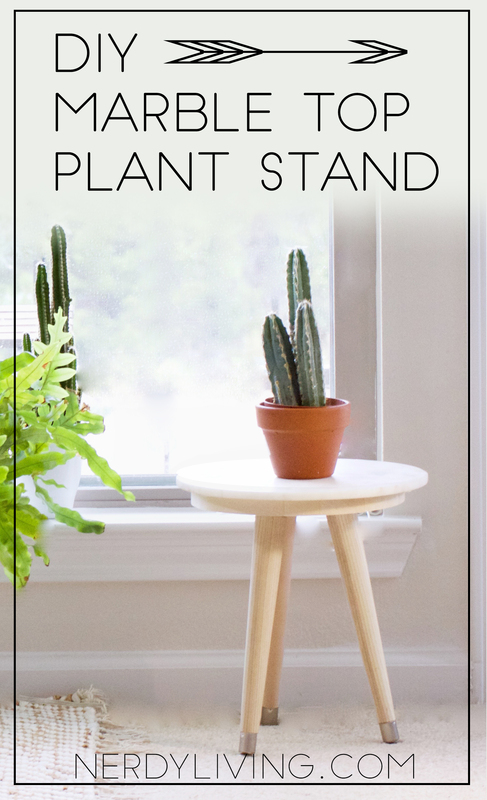 Should I make another plant stand with a different finish? Should I change the finish on this one? Which of the variations would you make for your plants, or would you make something other than a plant stand? Do me a solid and pin this image. Excellent tutorial! The pictures are both stunning and helpful. I’m definitely inspired. I think perhaps your next project should be a little nightstand.